Ahead of graduation time Rufus King senior Daniel Ford almost missed out on an opportunity of walking across the stage. Ford owed the school $290 in graduation fees and the day before graduation he realized he couldn’t pay the bill, leaving him in a tight situation. Ford says his family is in a tough financial situation right now and talking about it in class yesterday, his classmates learned of his dilemma and decided to act quickly. “Daniel is like a sweet, a sweetheart person for one,” Neal said. Parents, teachers, alumni, and local sneaker store Trusted Kicks all pitched in. “This is kind of like how can I say, a blessing this all happened in one day. I just love it, you know. Things can happen like all of sudden just in a snap,” Ford said. 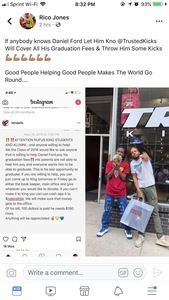 But he got more than just his graduation fees paid, Trusted Kicks also gifted him new shoes, a shirt, and money to help he and his family out. "It just felt great just to see a smile on his face,” Eric Allen said, a manager at the store. It's a very special memory Ford will remember for the rest of his life. He told TODAY’S TMJ4 he’ll be applying to MATC. He wants to study culinary arts because he loves to cook.